Noah's Ark Waterpark, located in Wisconsin Dells, WI, and advertised as America's largest waterpark, will open a large new waterslide in 2018 named Raja. 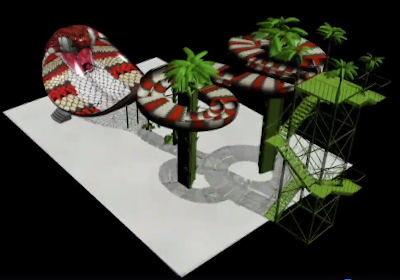 The slide is cobra themed, hence the name, and will feature sliders coiling their way down from heights of 65 feet up into a enormous cobra-themed wave wall. The wave wall comes complete with a menacing cobra head, fangs and all. The new slide is truly snake themed head to toe. 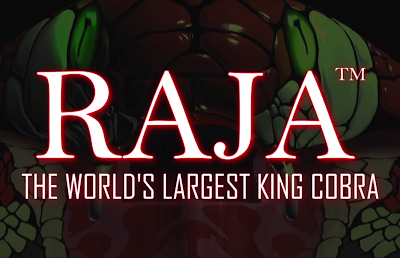 Raja will be decked out in alternating red and white snakeskin patterns, and feature two separate paths to the bottom. Passengers will race each other in tubes through two separate helices, before encountering a steep 37 foot drop that leads into the wave wall with a giant cobra head overlooking it. The path of the slides stretches 335 feet long, making it the largest slide of its kind. Raja will be featured prominently at Noah's Ark, located along Wisconsin Dells Parkway and adjacent to the Flash Flood ride. 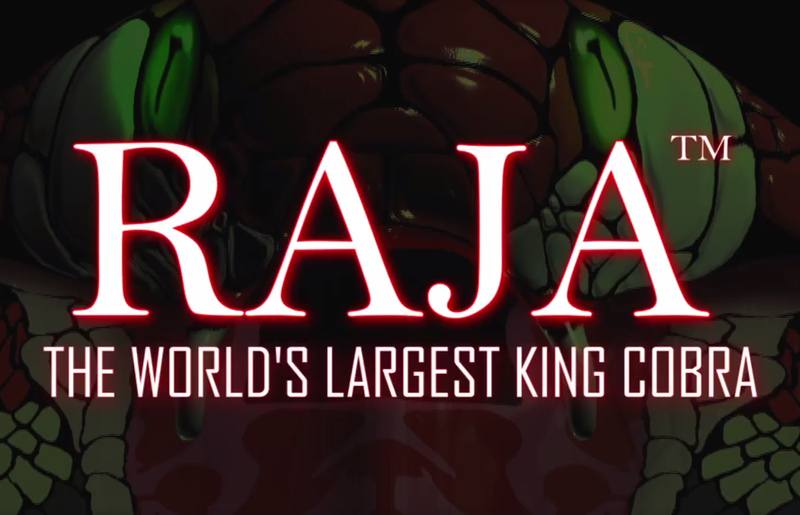 Manufactured by Polin, Raja will only be the second slide of its kind in America. The first was King Cobra at Six Flags Hurricane Harbor in New Jersey, which stands 56 feet tall, has a 25 foot drop and 256 feet of slide. 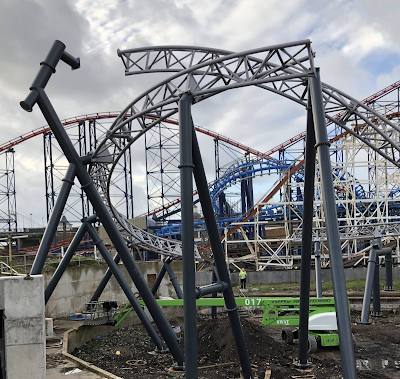 The crop of new-for-2018 roller coasters around the world is an exciting bunch, and one of the standouts is Icon, opening at Blackpool Pleasure Beach. 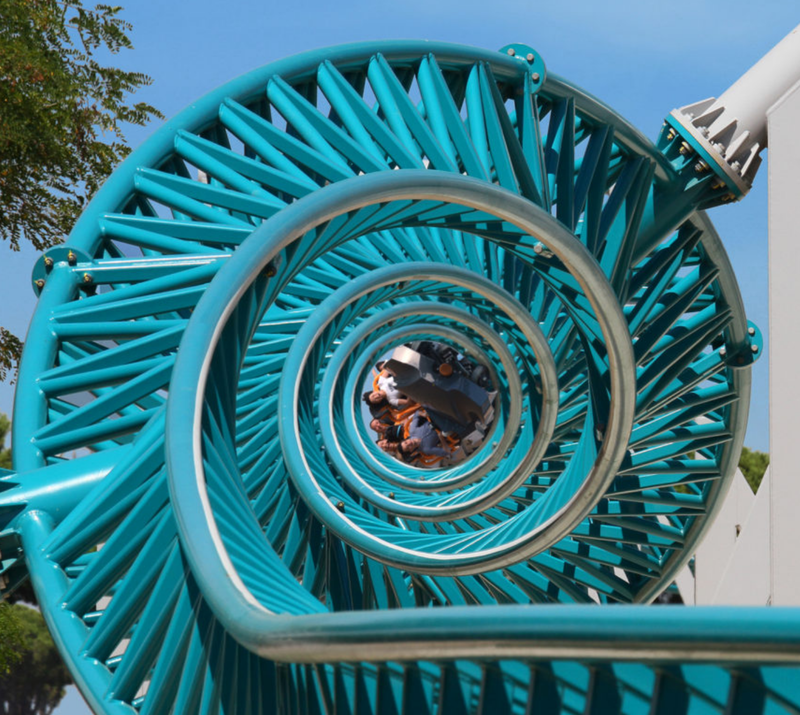 The extremely custom designed Mack Rides launch coaster will twist its way throughout a large section of the classic seaside amusement park, interacting with several rides and buildings along the way. It was announced some time ago, with plenty of lead time built in to construct such a complicated but thrilling addition. Now, we've finally entered the exciting construction phase of Icon where track and supports have started to be placed. 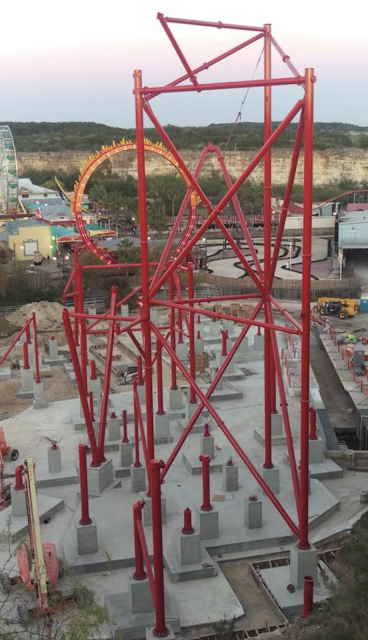 Granted it's not a ton of track just yet, seen above, but it's wonderful to see the ride standing. Featuring gray track with black supports, the finished ride will feature 3,750 feet of track including two separate LSM launches. 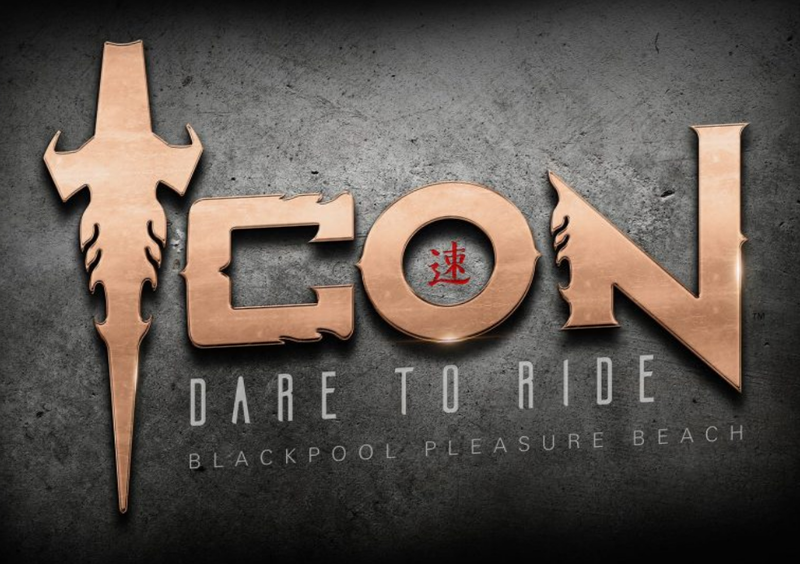 Features on Icon include a layout that includes heavily banked turns and little straight track, aside from one huge air-time hill and the launches of course. There will be two inversions found on the ride, a giant Immelmann after the second launch and a heartline roll. The layout is so twisted that it might be easy to forget what the ride will offer as we watch it be constructed, so check out the video below for a nice refresher. Announced as the world's first single rail roller coaster, Six Flags Fiesta Texas' Wonder Woman: Golden Lasso Coaster will be one of two of the same type of ride to open in 2018. Regardless of which technically opens first, the rides are highly anticipated by coaster fans as they represent an all new type of steel roller coaster, capable of giving a smooth ride with extreme maneuvers in a small space. At Six Flags Fiesta Texas, construction is moving along quickly on the coaster, fabricated by Rocky Mountain Construction. Above is a photo that the park's president shared of the single rail track that has arrived at the park. This track represents the "golden lasso" aspect of the Wonder Woman theming, though the entire ride will take visitors into her world. This view, also shared by the park's president, shows the spider web of bright red supports that are now in place for Wonder Woman: Golden Lasso Coaster. 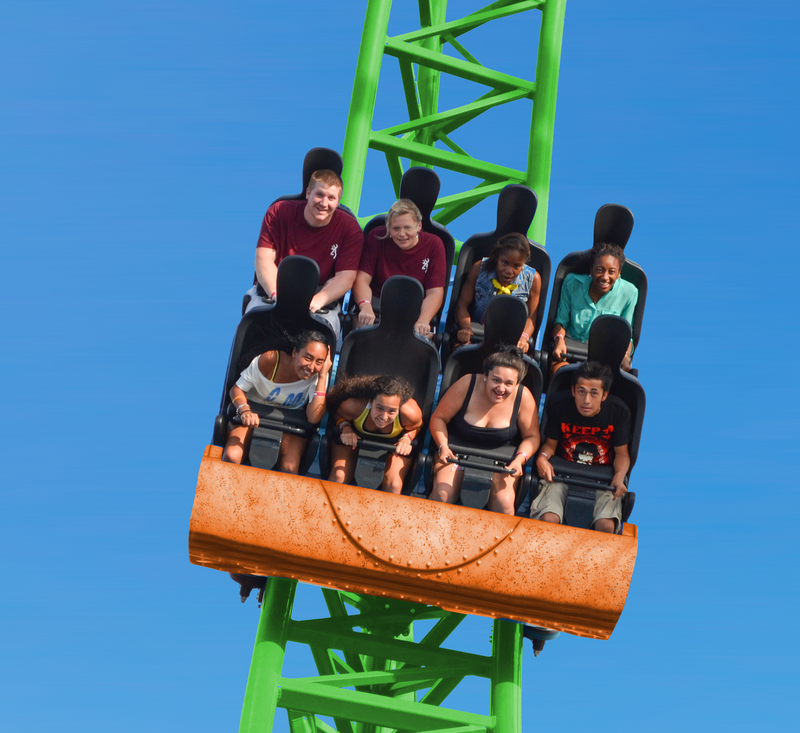 The ride, featuring cars that seat 8 passengers individually, stands 113 feet tall and features a 100 foot first drop that dives at a 90 degree angle. The highest supports that can be seen in the foreground of this photo are for the top of the lift, where a swooping 180 degree turn takes place before the drop. The rest of the 1,800 feet of track includes three inversions, tight twists, an elevated s-curve, air-time moments and more. You can check out some additional construction photos via this link. 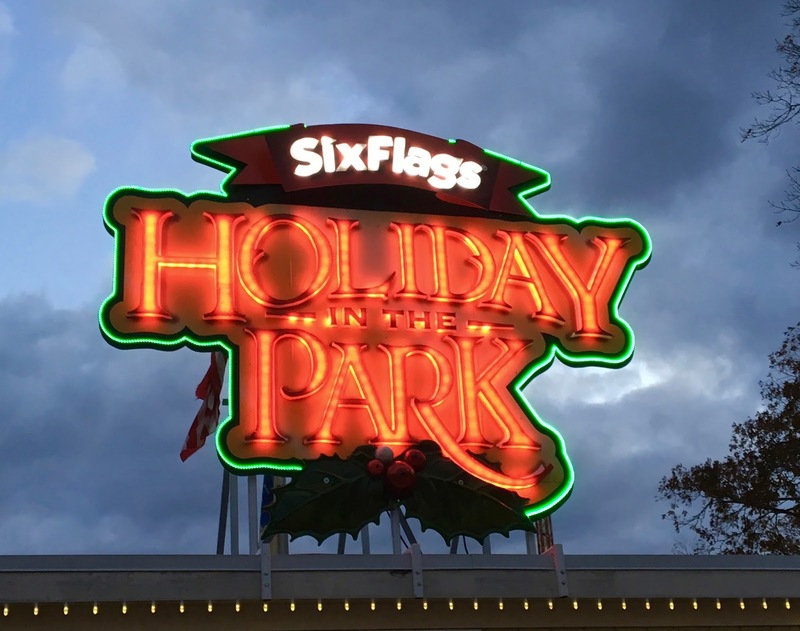 Now in its third season at Six Flags Great Adventure, Holiday In The Park is back - brighter and merrier than ever before. 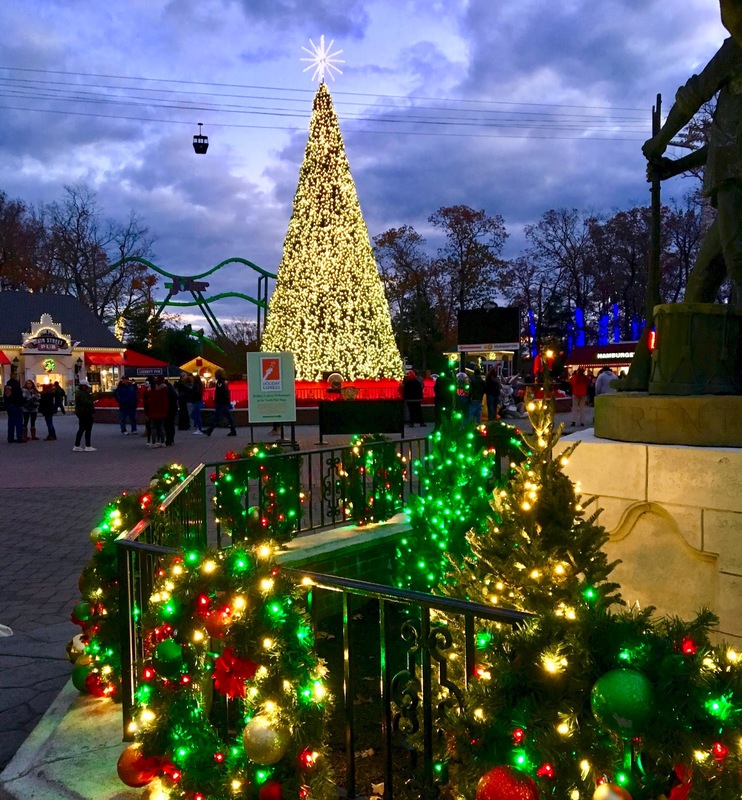 The annual celebration of the holidays is now running at Six Flags Great Adventure, giving visitors more ways to have holiday fun this year with expanded areas (13 in total! ), new entertainment and more. After entering the park through the peacefully decorated Main Street Christmas, you'll soon come this 52 foot tall Christmas tree that performs a special light show named Holiday Magic: A Celebration of the Season. The show takes place on the tree's surface through ever changing lights, combined with snow flakes in the air and a stirring music soundtrack. Here is a little clip of the show, taken near the end. 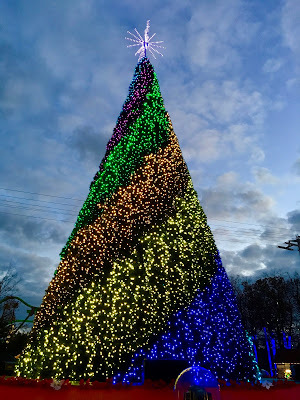 The light displays on the tree are impressive even when the show is not being performed (which is about every half hour), but even more magical when accompanied by music. Everyone who visits Holiday In The Park will want to make sure they stop by to see Santa himself, and that's possible at his home in the North Pole section. 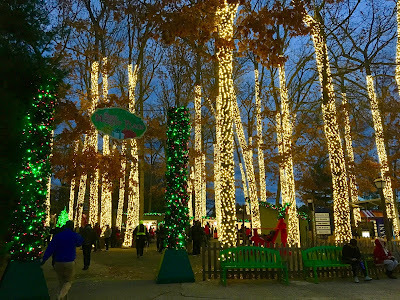 The trees here are lined with beautiful multicolored lights, presenting a truly festive atmosphere. Kids age 8 and under can head inside and have their photo taken with Santa, and next door to his home they can write a letter to him and visit with talking reindeer at the North Pole Village. One area that I wasn't able to check out in past years is the Merry Market Place, which beckoned me from afar with its brilliant white lights. The section features different food and beverage locations, shops, and many warm fire pits that allow for S'mores making. If you need a little boost to keep you warm, the brand-new Yuletide Brews is a perfect choice, serving spiked hot chocolate and other tasty treats. It was quite popular when we visited, a bit hit with visitors. Holiday In The Park is filled with live entertainment, some of which runs the course of the event and some for a more limited time. 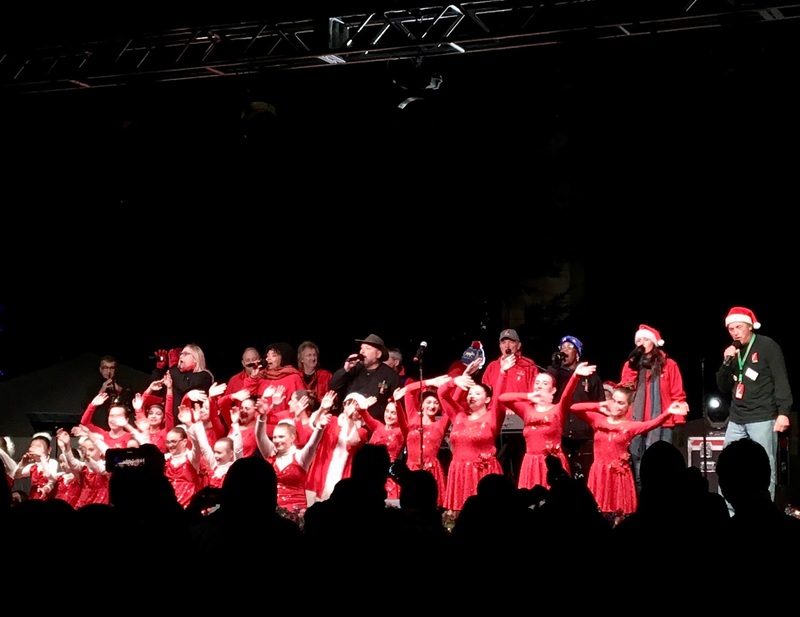 Our visit included a special bonus of being able to check out the performance of the talented Holiday Express, an organization whose mission is to spread holiday cheer through various volunteer programs. Elsewhere in the park visitors can line up to have their photos taken with special characters, such as the Peppermint Princess, Snow Queen, Poinsettia Princess and even giant toy soldiers. Kids will also love The North Pole Research and Development show, featuring Mrs. Claus and Gizmo who discover what's new for Christmas 2017 via magical surprises and inventions. 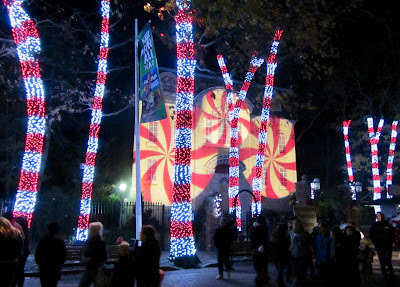 There are many gorgeous sights at Six Flags Great Adventure's Holiday in the Park, but this image of the totally covered facade of Skull Mountain, located in Poinsettia Peak during the event, is breathtaking in person! 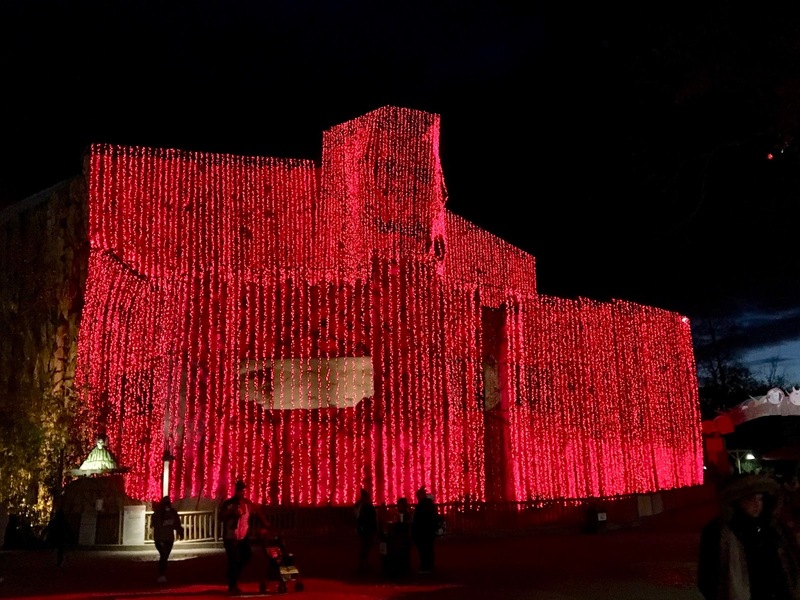 The park drapes the entire front of the building in strings of crimson lights, shimmering in the darkness. The ride inside is open as well, along with nearly 30 rides and attractions in total. These include some of the park's big rides like Nitro, the Joker, Batman: The Ride and Superman: Ultimate Flight. It may be a bit cold on some of the coaster rides, but it's awesome to be riding big coasters in the Northeast in December! With each turn into a new section of the park, there's amazing new displays to see. 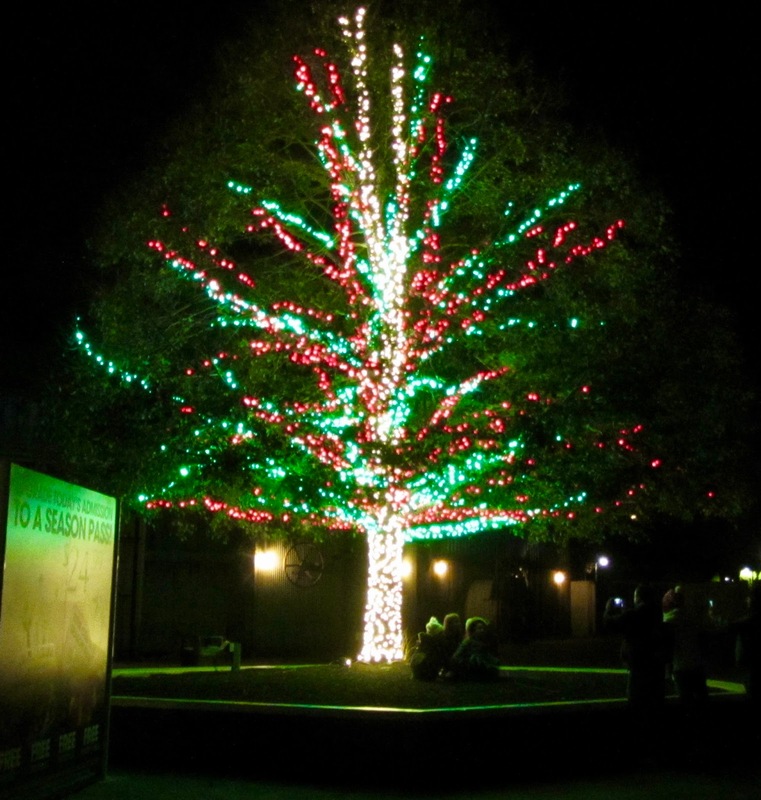 This tree, for instance, is located within the Holiday Memories section. 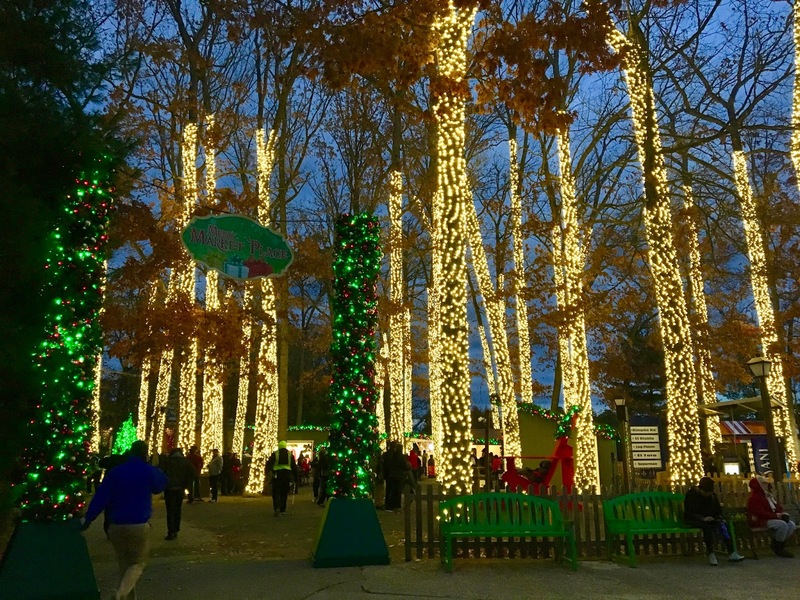 This section features several of the park's bigger rides, along with Mistletoe Moments, where you can take some great holiday selfies. Another live show can be found here, named Holiday Harmonies with Hotsy Totsy. The 1950s style trio covers many popular holiday songs, located not far from warm fire pits and tasty food treats. New this year is the Holiday Heroes section, which is located in the area surrounding the new Justice League: Battle for Metropolis ride (which is open for the event). The section has a red, white and blue theme along with some classic new decorations for the Justice League building. 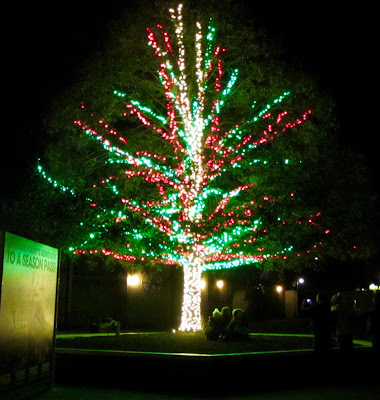 You can also pick up some tasty treats at Munchopolis and Metro Grill while in the area admiring the lights. The Showcase Theater is located within Holiday Heroes, and it's home to the all-new live show called Spirit of the Season: A Holiday Celebration. 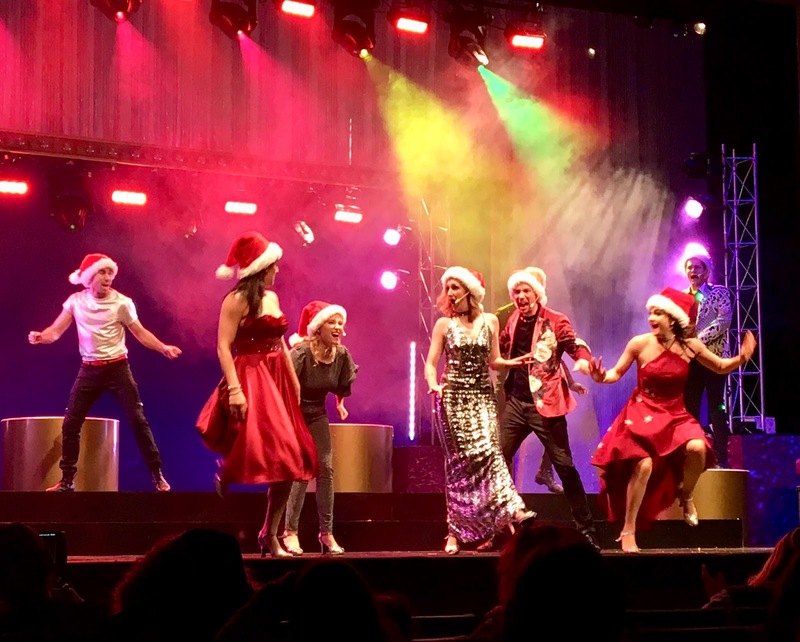 The song and dance show features a cast of super-talented performers that cover everything from holiday classics to modern hits and everything in between. 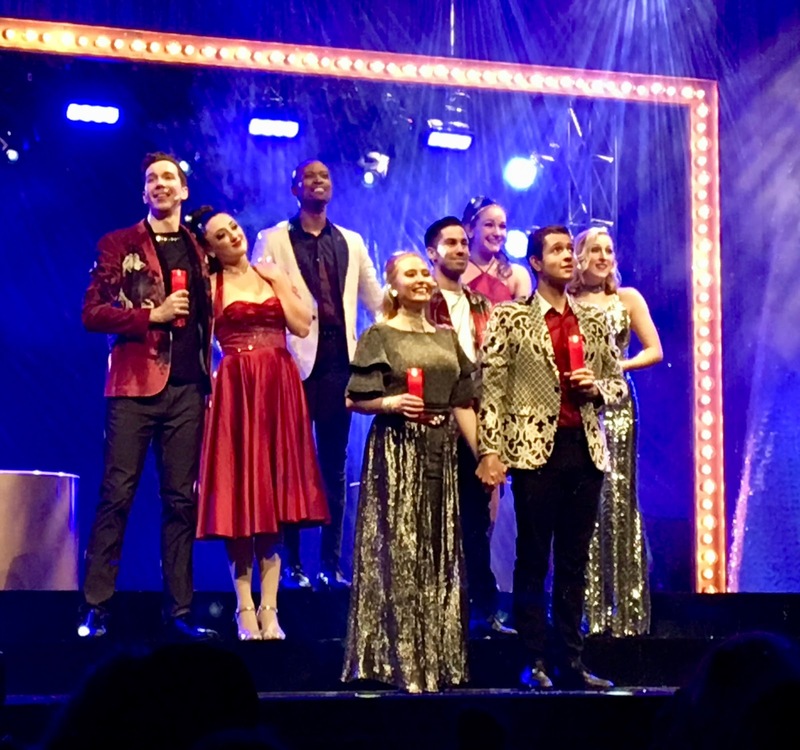 The show makes a perfect break for exploring, and allows guests to warm up and enjoy a spectacular performance. If you're lucky, you just might get to see some snow falling during the finale, too! 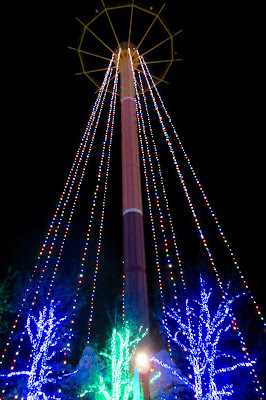 Elsewhere in the park, among the roars of Superman: Ultimate Flight and the Green Lantern coasters, Treetop Summit offers this gigantic tree formed off the park's parachute ride tower. Many of the trees in the area are decked out in blues and greens that match the colors of some of the big attractions that are open. 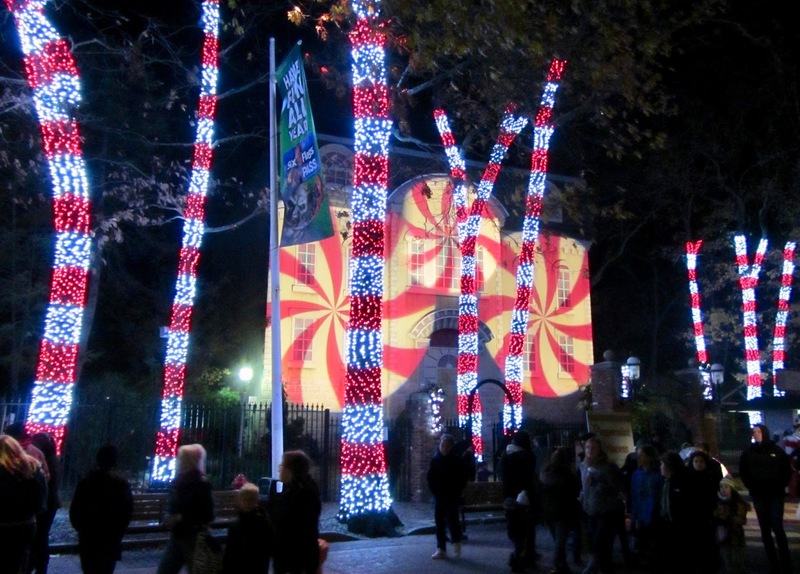 It's hard to miss the lights of Gingerbread Junction, which features giant trees that appear to be peppermint twists. Beautiful! This is also the home to Dot and Drop Gingerbread, who are happy to meet with guests for photos. The land also has special holiday themed games to play, such as Knock The Elf Off The Shelf and Reindeer Roundup. 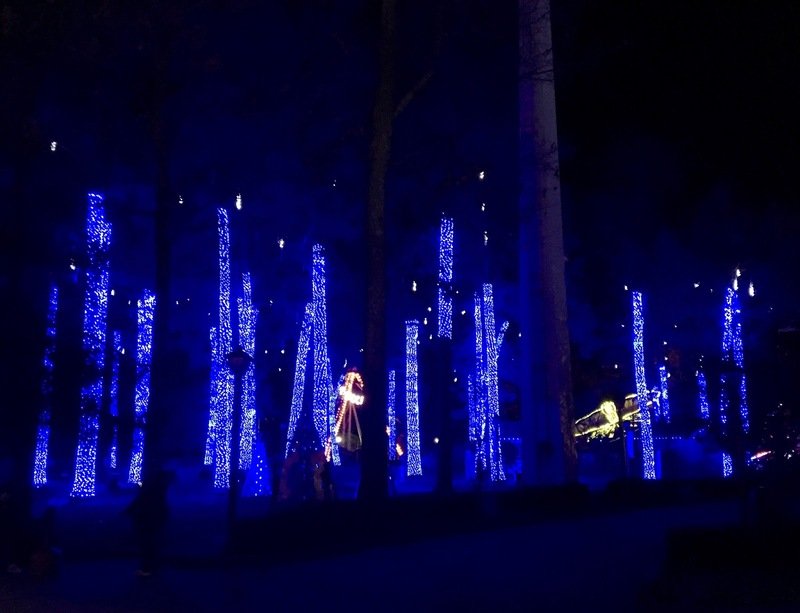 My absolute favorite section of Six Flags Great Adventure's Holiday in the Park is Polar Point, where the beautiful blue lights snake up all the trees, with gently falling icicle lighting hung at the top. The area is even bigger this year, and this photo doesn't even show the whole section. 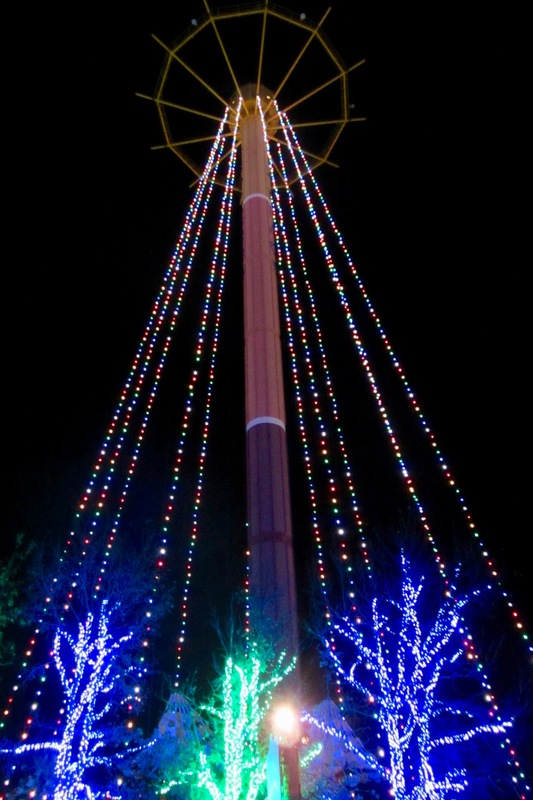 For scale, you can see the lights of two flat rides in the background, rather small compared to these towering trees. 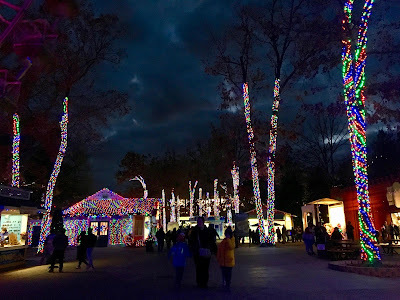 This video gives an idea of how peaceful the section is, which will also feature all new arctic globe lights that will be great for holiday photos. Polar Point also is home to the Big Wheel, the park's Ferris wheel, and while we didn't get to take a spin I can only imagine how beautiful the view is from up top. Also, the Polar Bar, within Polar Point, serves turkey legs, hot chocolate and more. If you're really hungry for a full meal, I suggest stopping in at Granny's Country Kitchen in the North Pole, as they serve fried chicken, mashed potatoes, hot turkey platters and more - perfect comfort food for the holidays! Between the holiday shopping, special food an beverage treats, one million plus lights and other displays, towering thrill rides, and overall charm, Holiday in the Park has something for everyone. The event takes place on select days through January 1st, 2018, see the park's website for dates and times. It helps to dress warmly, of course, though the park has plenty of fire pits and other ways to warm up throughout the evening! Also watch out for the upcoming special Snow Day event at Holiday in the Park, where guests can take part in the world's largest snowball fight! Many thanks to the park for having us out to check out the event! 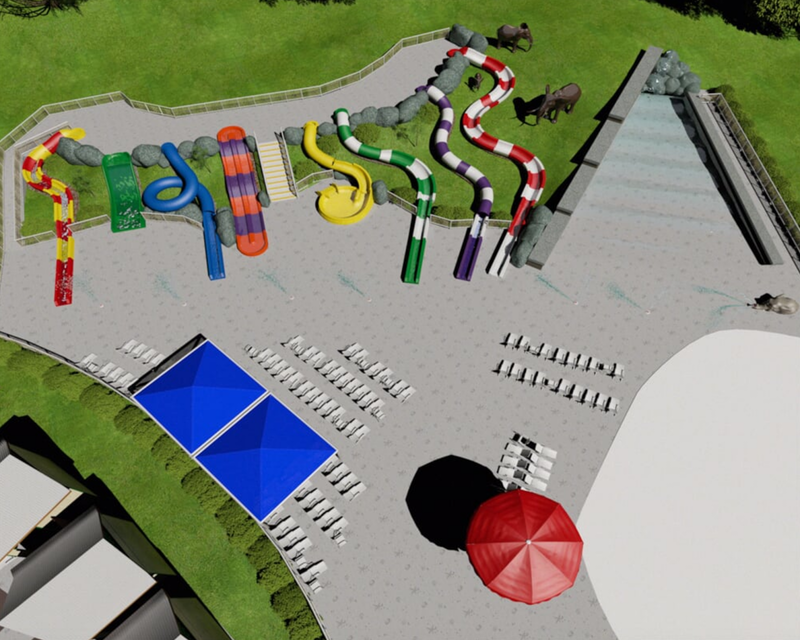 A towering new thrill ride will open at Magic Springs in time for the 2018 season, the amusement and water park has announced. 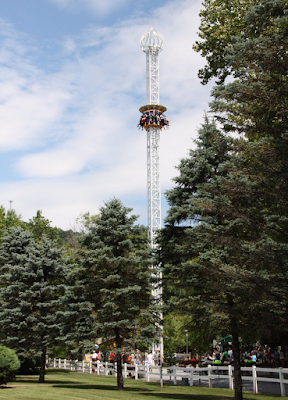 Known as Brain Drain, the ride will be a Larson / ARM Super Shot free fall tower, known as one of the most intense free fall experiences out there. It will stand 120 feet over Magic Springs, blasting riders downward at more than 45 miles per hour. Magic Springs has been steadily expanding their water park in their most recent capital additions, but the amusement park side has not seen a new ride added in many years. Brain Drain will certainly fill that void! 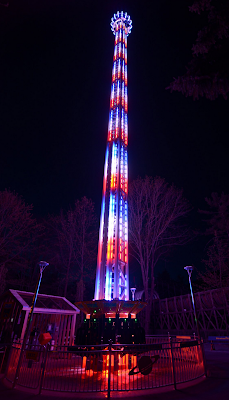 The photos that the park released are of similar Larson / ARM tower rides, which as exemplified in this photo have some amazing light packages for once the sun goes down. No doubt that Magic Springs will use their new Brain Drain ride as an in-park billboard, beckoning riders from afar. 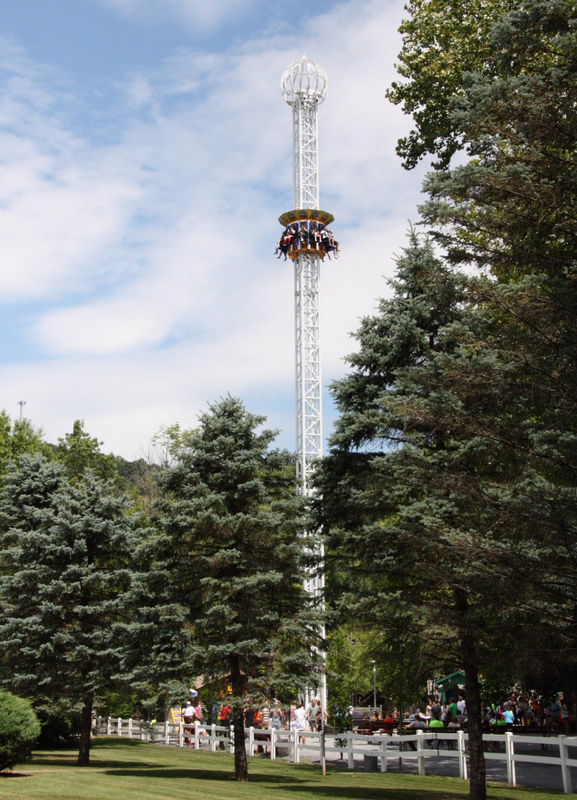 Many other similar Larson / ARM drop rides can be found throughout the country, such as StratosFear at Knoebels and Drop Zone at Kemah Boardwalk, and if you've been on one of these before then you know why the ride's addition is so exciting for Magic Springs! Holiday World & Splashin' Safari has announced a $3.5 million capital expansion plan for 2018 that will see changes made in both parks, including a significant new attraction in the water park. Seen in concept art above, the new area will have two distinct attractions, both aimed at kids under 54 inches tall and their families. 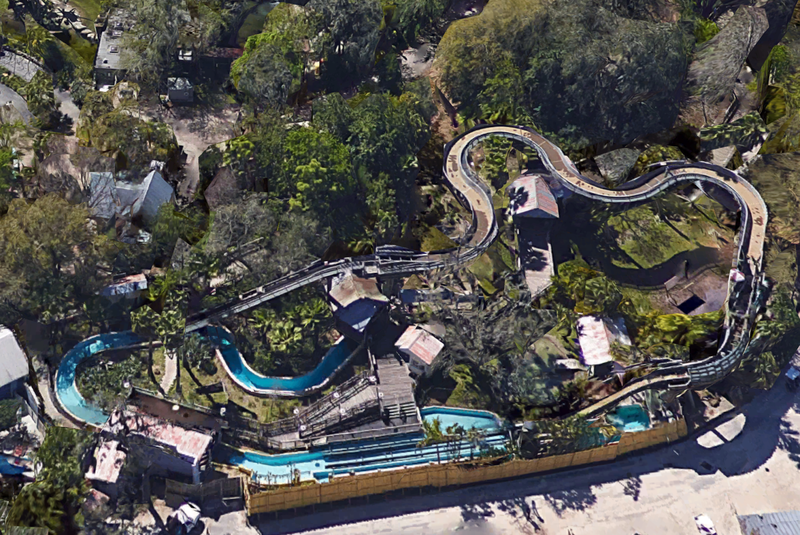 Tembo Falls is the water slide complex seen on the left of the above aerial view of the expansion. 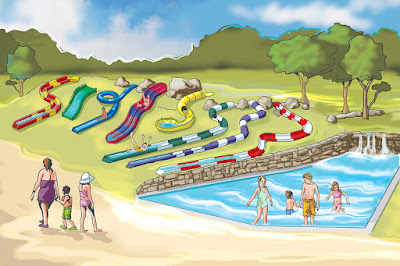 There will be a total of eight new water slides added, each for kids. There will be a variety of slide types added, including "twisters, a helix, a mini-bowl and two racing slides." Kids will also love Tembo Tides, a junior sized wave pool that will have various spray features included in the shallow end of it. Guests will also want to check out the new Riverside Retreats, described as "mini cabanas" in the water park. Elsewhere in the amusement park will be all new live entertainment, including a "stunt show, musical magic show and a strolling brass band." Various track improvements will be made to the Voyage wooden roller coaster, and an electric car charging station will also be added. Along with the announcement came this video showing off the various additions, check it out below! Legends: Adapting Intellectual Properties for Parks and Attractions: What Works, What Doesn't. 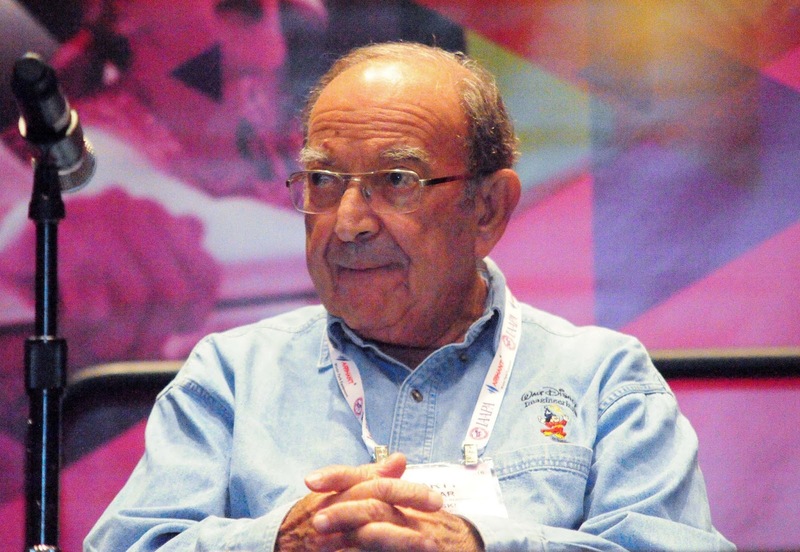 It was Wednesday afternoon again at IAAPA, and that means one thing. The Legends Panel, organized by Bob Rogers of BRC Imagination Arts,, and sponsored this year by Whitewater. You can see the empty chair next to Scott Trowbridge, in honor of Marty. Who will fill his shoes? Many eagerly await to find out. Joe is the lead designer of Disney’s Pandora, The World of Avatar and Disney's Animal Kingdom. Rohde was also the principal creative force behind the park's Expedition Everest thrill ride, which debuted in 2006. He was one of the lead designers behind the Aulani hotel in Oahu, Hawaii. 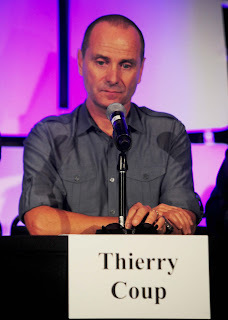 Thierry Coup, Senior Vice President - Creative Studio, Universal Creative. Thierry leads the creative development of upcoming attractions for Universal Parks and Resorts globally. He has played an integral role in shaping the blockbuster rides and attractions at Universal Parks and Resorts for more than 20 years. Thierry is probably best known for pushing the envelope in the creative design of world-class projects, such as The Amazing Adventures of Spider-Man, Transformers: The Ride 3D, King Kong 360-3D, and The Wizarding World of Harry Potter. Scott is WDI’s creative lead for all things Star Wars, including the design and development of 2 new 14-acre lands going into Disneyland and Disney’s Hollywood Studios, Star Wars: Galaxy’s Edge. Scott previously led WDI Research & Development and oversaw the Blue Sky Design Studio where Imagineers from multiple disciplines come together to explore and develop new ideas for Disney’s theme parks and resorts worldwide. 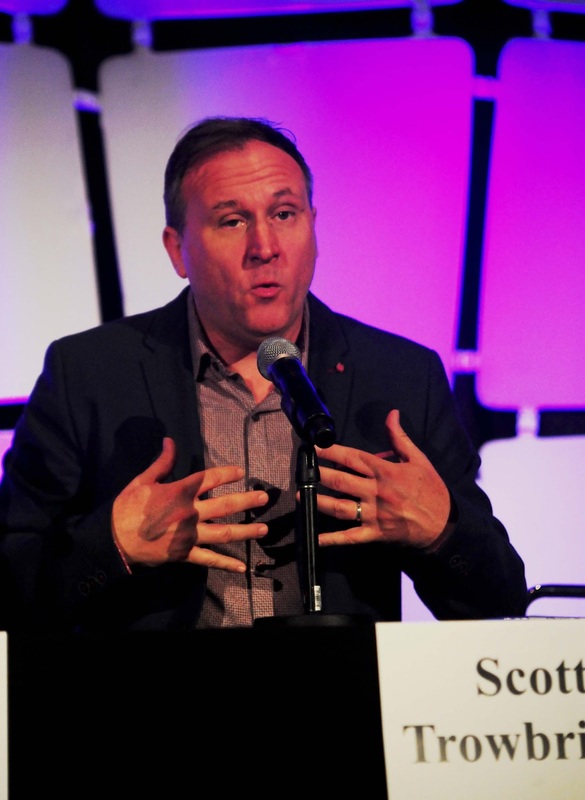 Scott has spent most of his career dreaming up new and unique ways to entertain people, ranging from state-of-the-art themed attractions to film, theater and retail. 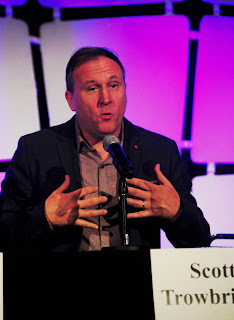 Prior to joining Disney, Scott worked as vice president for the creative division of NBC/Universal’s Theme Park & Resorts. 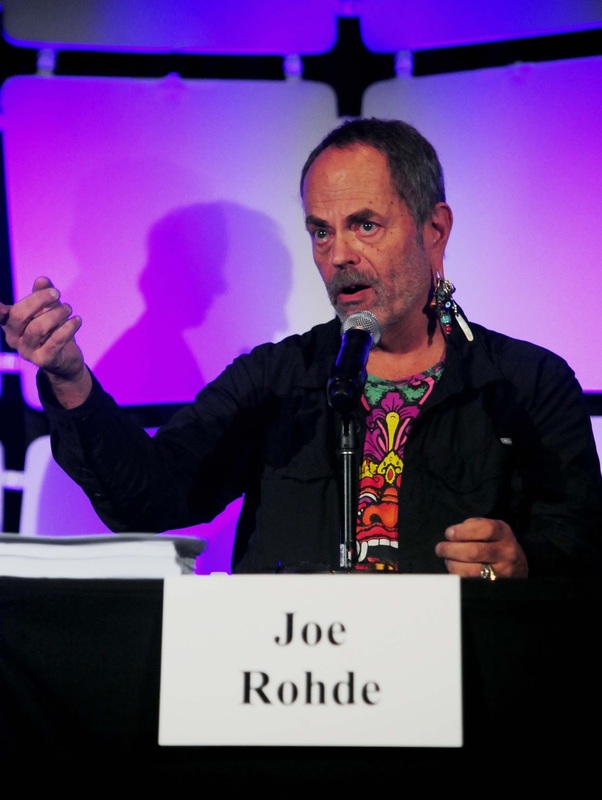 Joe: A film is a 3rd person narrative whereas an attraction is a 1st person narrative. Our artistic medium is direct experience and everything should be based on everyone instead of the purest fans of the IP. 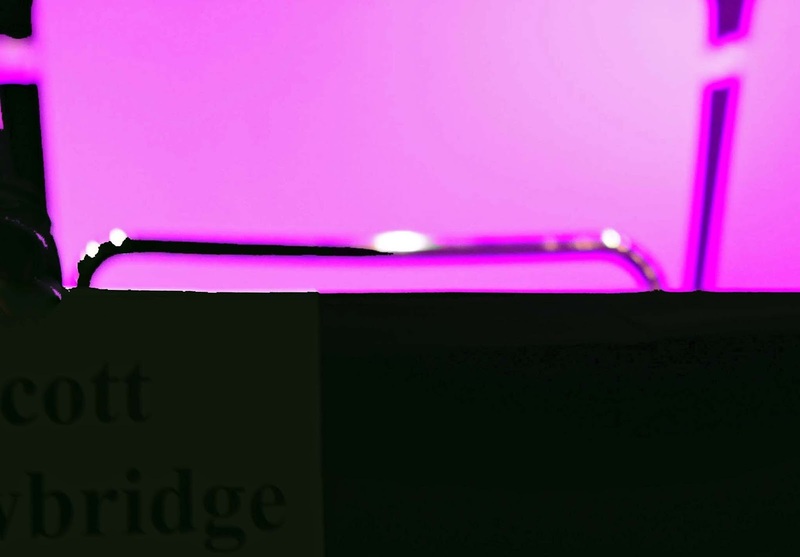 Joe studies classical architecture, searching for what engages the audience. Thierry: Attempting to exceed the audience expectations is the fun part. we work with a 90-second storyline, and we created Spiderman the Ride before the movie came out. Thierry finds inspiration from TED Talks, and regularly attends the conference, and also studies Leonardo DaVinci, who combined mathematics, engineering, and art with his work. Scott: It is our job to understand the DNA of a creative work and distill it into an attraction. Any sufficiently advanced technology is indistinguishable from magic. No fad will overcome a weak story. The audience is the park guest, and they own the park, creators are just stewards of the park. Like all good things, this too had to end. Instead of crying because it was over, most laughed because it happened as they queued up for autographs and photographs. If this doesn't happen next year we might blow off IAAPA. On a slow news day, much like today, it's nice to share news of something that may not be news per se, but still quite interesting nonetheless. 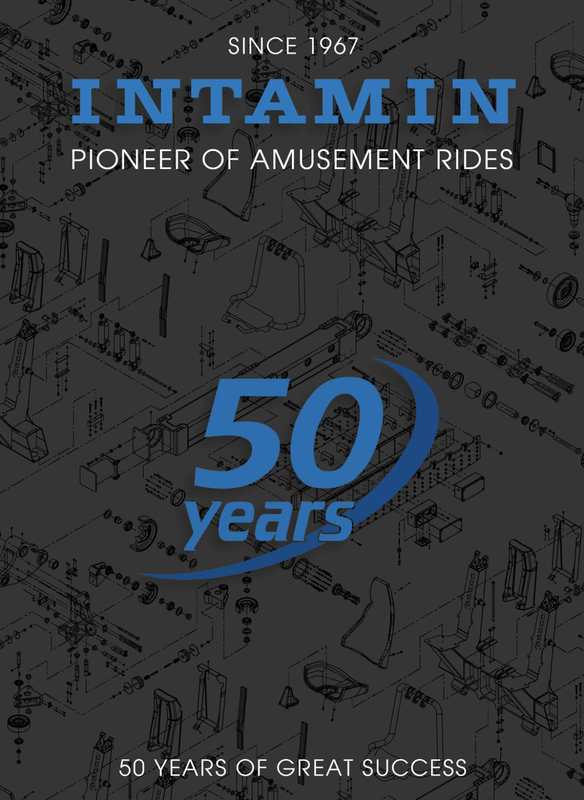 Intamin has a new website, or at least one that's new to me. I don't know exactly when it launched, but it's filled with great information and photos on many of their rides and attractions. 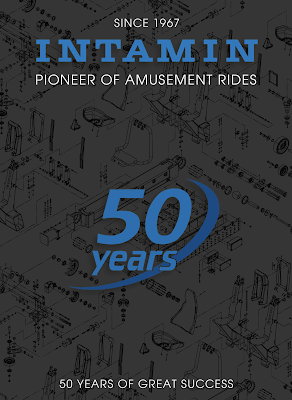 Intamin is celebrating their 50th anniversary right now, quite an accomplishment so many congratulations to them, and has updated their company profile to reflect the milestone. That catalogue alone should fill up a bit of your time! You can browse through each of their various ride types, from coasters to free falls and just about everything in between. The company has highlighted many of their significant projects, and each one also has links to other documents such as ride spec sheets and more. It's really a lot to look through, but a great way to learn more about one of everyone's favorite amusement ride manufacturers. 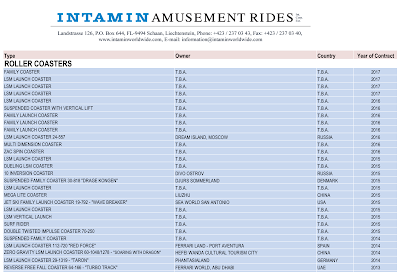 One other item to point out is Intamin's reference guide, which can be downloaded directly via this link. It gives a list of all contracts the company has signed, by ride type and by year. This document is a gold mine for fans of the company, showing statistics on all the fantastic rides they've created. Plus there are specific ride type details as well, for example I did not know that SkyRush at Hersheypark is technically know by the company as a "Wing Coaster" with "Half-Wing-Train" designs. Amusement park nerd alert! Maybe even more interesting is the top of the reference list which shows rides not yet announced but that have contracts signed for. Granted there are no hints as to where the rides will go, but it's fun to imagine where they will end up! 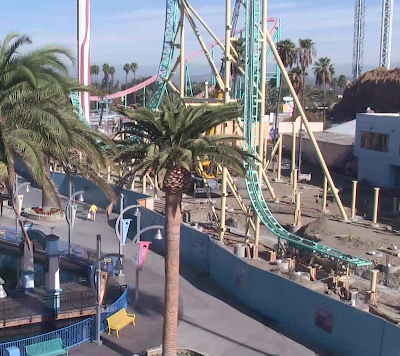 Today was a good morning for a check in on the progress of HangTime at Knott's Berry Farm. The new custom-designed Gerstlauer Infinity coaster is rising quickly at the Farm, with track instillation taking place daily. This view from the webcam shows a significant amount of track installed in the past week. 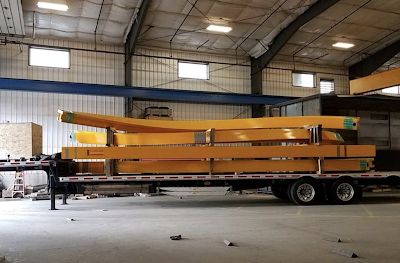 The on-site crane has been busy, with track applied to the 150 foot tall vertical lift hill, along with the drop and the run into the first big element. Throughout the course of the ride there are plenty of other supports that have been added. 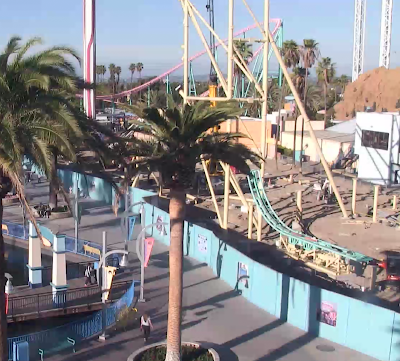 The park's 2nd webcam isn't focused on the ride, but that hasn't stopped HangTime from showing up on it. 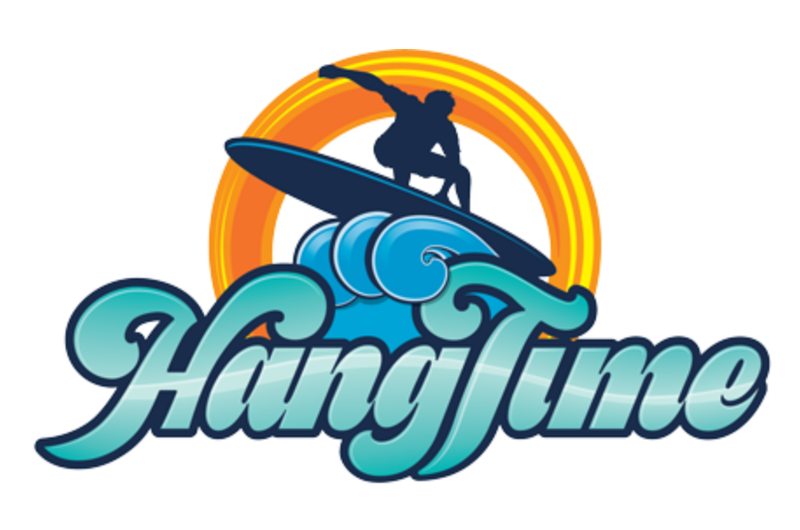 If you look in the upper left of the live view you can see HangTime towering over the Calico Mine Ride. The track is nearly to the top of the structure, and the drop has been applied just as far. All that remains is the apex of the lift, along with the the track that will hold the trains for several seconds at a 60 degree angle, facing the ground below them before they drop. For another recent update on the coaster, with plenty of photos taken from inside the park, check out California Coaster Kings. 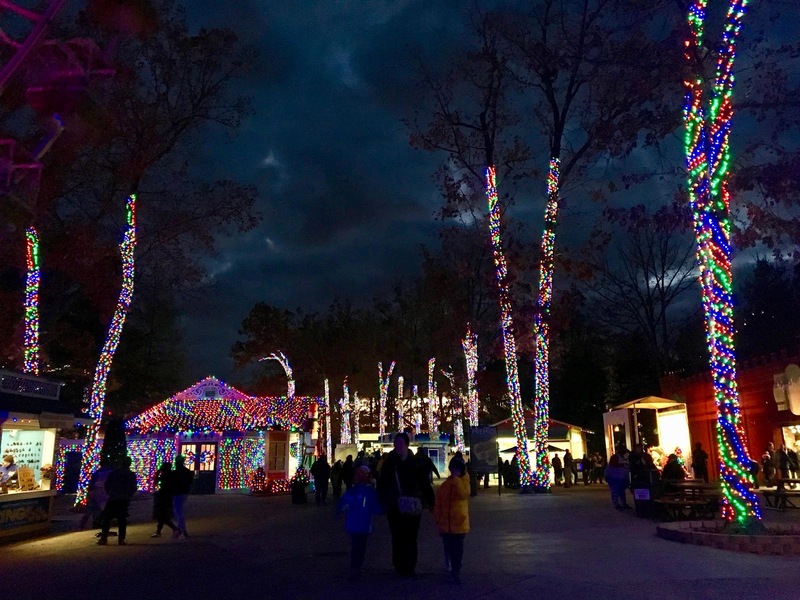 The holidays are just around the corner, and that means that special events celebrating them are now starting to operate all parks over the country. New this year is the first ever Christmas celebration inside The Wizarding World of Harry Potter at Islands of Adventure and Diagon Alley at Universal Studios Florida. 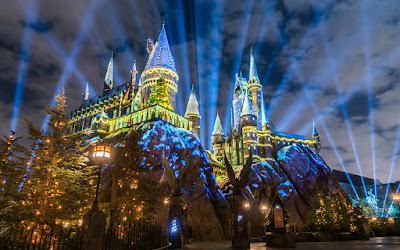 However, the main attraction of the celebration is undoubtedly The Magic of Christmas at Hogwarts Castle, which (seen above) brings the massive Hogwarts Castle to life several times each evening. 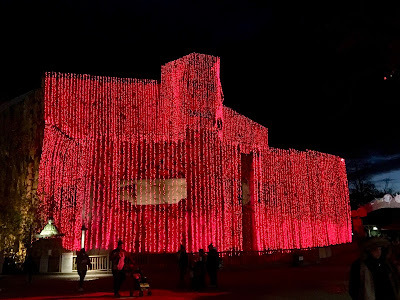 The brand new projection mapping show literally takes place on the facade of the castle, featuring "festive décor, candlelight and moments inspired by the films." The show, which according to its developers features "ghosts of Hogwarts singing carols, students riding broomsticks and creating snowmen, a moment inspired by the Yule Ball and many more surprises," is premiering this weekend to park visitors. If you can't make it in person, many videos of the show have already popped up online, so if you want to check it out here is one from Attractions Magazine. Make sure to watch in high definition. 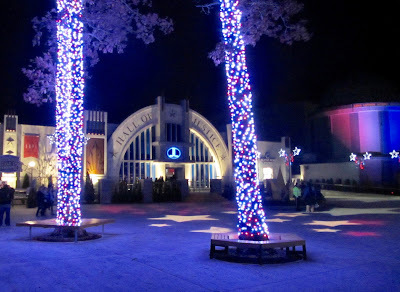 Other holiday special events include decorations throughout and new live entertainment in both Harry Potter themed areas. Within the Wizarding World of Harry Potter the Frog Choir has several new holiday themed songs that will be performed. Over in Diagon Alley Celestina Warbeck has cooked up four new songs, such as "Nothing like a holiday spell" and "My baby gave me a Hippogriff for Christmas." The Gale Force roller coaster, located at Playland's Castaway Cove in Ocean City, NJ, just opened this past May but is already having its track removed. 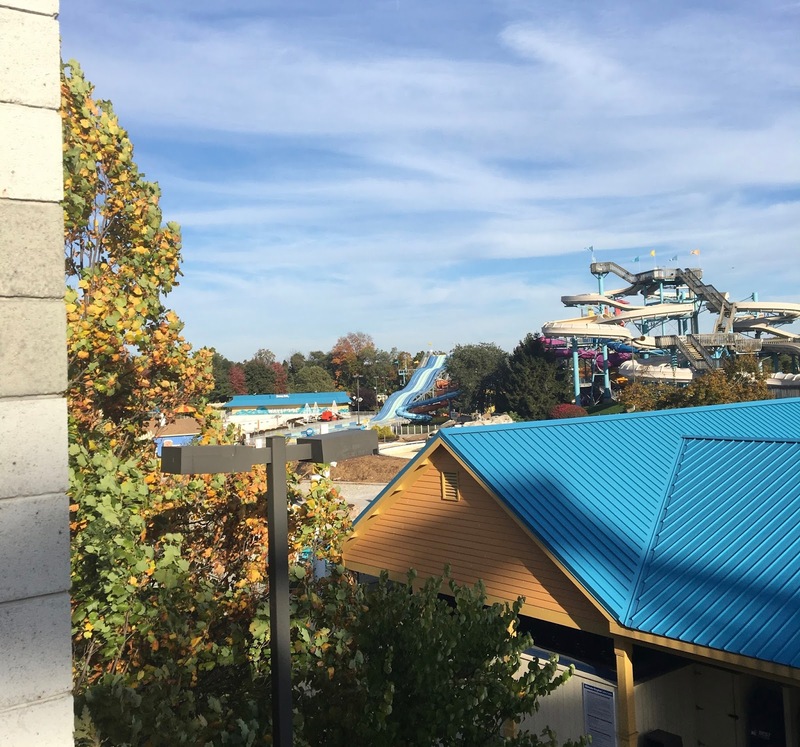 Seen above in a photo from a news story, the ride's blue track is being removed from the support structure in order to be replaced with all new track for the 2018 season. The coaster did not operate up to desired standards, it seems, dating back to its original opening year of 2016. Gale Force missed that season due to a segment of track having to be manufactured over after not aligning properly with the rest of the layout. The ride did open and operate safely this past summer, but according to park officials didn't provide the smooth ride they expected. Gale Force was designed by S&S Worldwide, who is paying for all of the ride's track to be replaced this off-season, before the park opens again for Easter in 2018. The slight alignment issues caused the ride additional downtime along with the bumpiness. The park expects to have the replacement track fully installed during January of 2018. 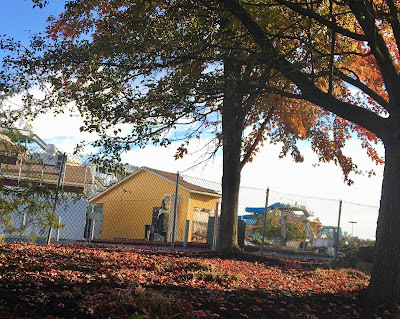 Hopefully this will allow Playland's Castaway Cove to operate the ride more regularly next year, and it's great to see S&S stepping up to replace the track at no cost to the park. 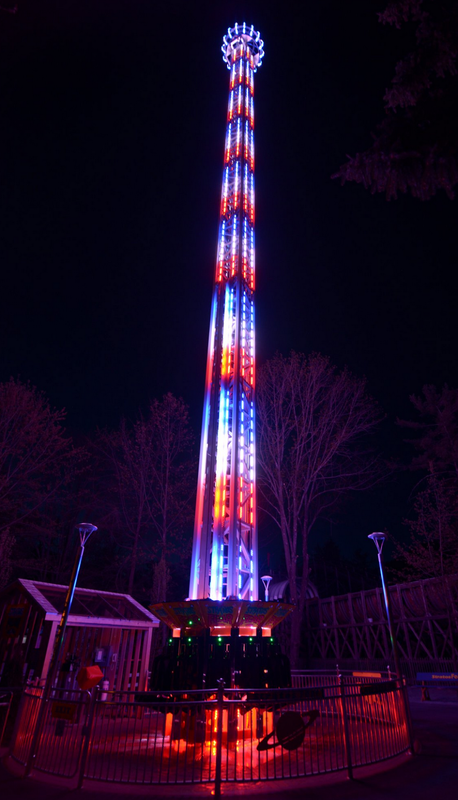 Gale Force features multiple launches that get the individual cars moving at 64 miles per hour, with a maximum height of 125 feet and 1,269 feet of track. Visitors to Tampa's Lowry Park Zoo will find an all-new water ride in 2018, named Roaring Springs. 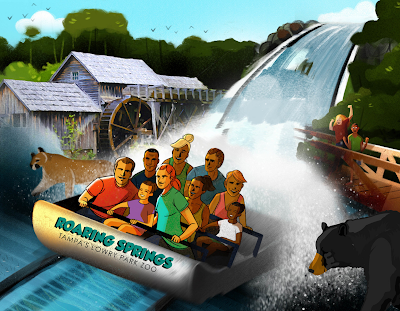 The new splash ride will "allow guests of all ages to discover a hidden part of Florida full of adventure and thrills. Explorers will board a boat and gently drift along a crystal-clear spring, surrounded by native landscape and wildlife. The journey takes a sudden turn when the elevation drops. Guests will feel a rush of adrenaline as they experience a 3-story splashdown." Exact details on the type of water attraction, including manufacturer, that is being added were not available just yet, though the concept art above looks like it will be either a modern version of a flume ride, or perhaps a small shoot-the-chutes. The ride will also come with a Canopy Walk, which will oversee the attraction. The project is the largest for the Lowry Park Zoo in the past decade. According to the park's press release, visitors will also "get back to nature and see a hidden part of Florida that remains untouched - a Florida that requires no filter. Explorers will catch a glimpse of black bears, alligators, panthers, Key deer and other native species as they trek along the winding Florida Trail." To make way for Roaring Springs, the Zoo will retire their existing log flume. That ride can be seen above... not a very big ride and from various videos on YouTube it doesn't look all that old, either. I'm not coming up with much on the ride's history, or even who manufactured it. Regardless, that's still the 4th flume announced to be closing this year in the name of expansion and progress. Darien Lake recently announced their plans to open a new roller coaster for the park's 2018 season, named Tantrum. 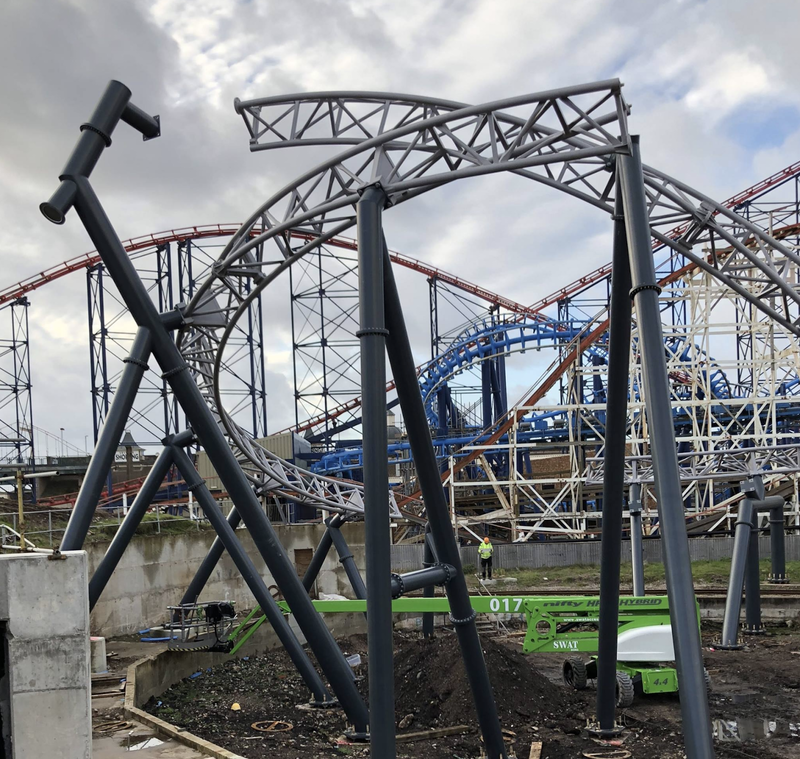 As expected, the new ride will be a compact Euro-Fighter design from Gerstlauer that will be a clone of the Iron Shark which operates at Galveston Pleasure Pier. 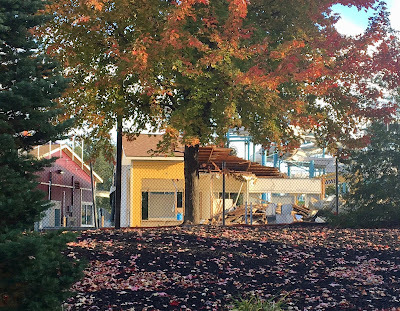 Tantrum will replace Darien Lake's log flume, Thunder Rapids, which means the new coaster will be quite visible from the park's entrance and parking lot areas. 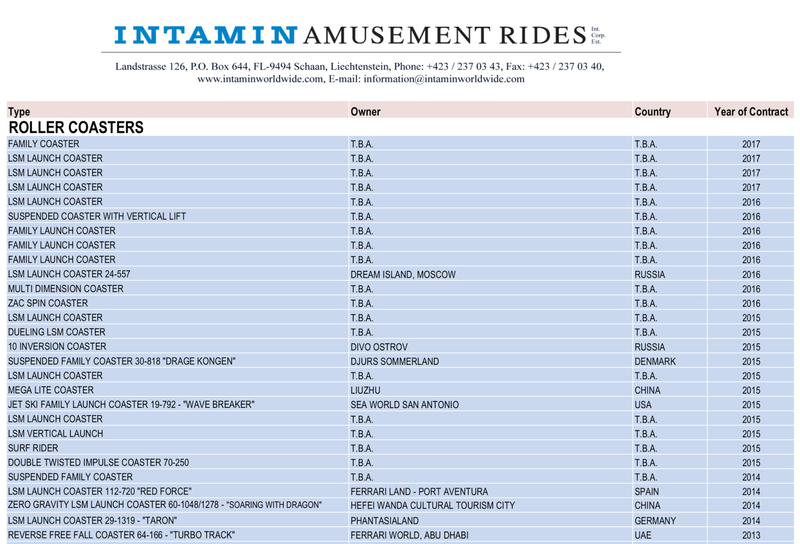 Tantrum will start with passengers, seated in individual eight-seater cars, heading up a vertical lift hill to 98 feet above the park. The first drop that follows will extend beyond vertical, coming in at 97 degrees. After hitting the top speed of 52 miles per hour, Tantrum heads up into a giant twisted inversion that ends in an Immelmann, then up into a a cut back, quickly followed by a tilted loop and the brakes. The experience will be quick, with elements taking place one right after the other. 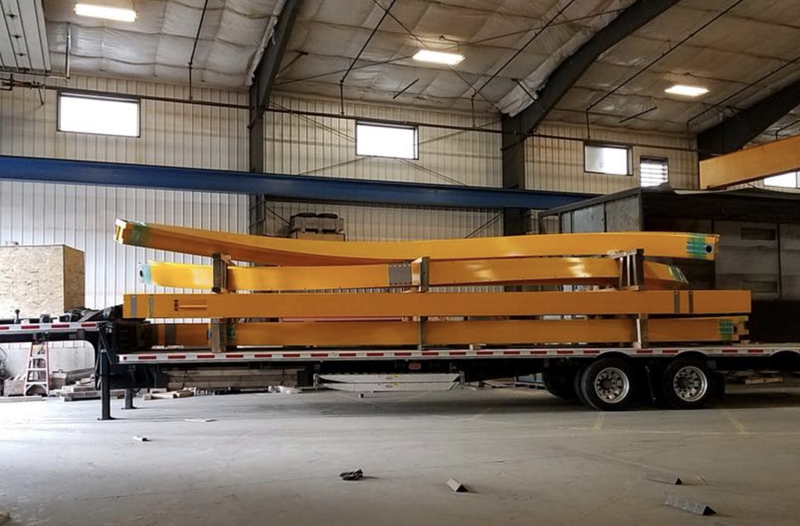 With many older wooden roller coasters quickly transforming into new steel hybrid rides, it's always neat to see a 'traditional' wood coaster being built. 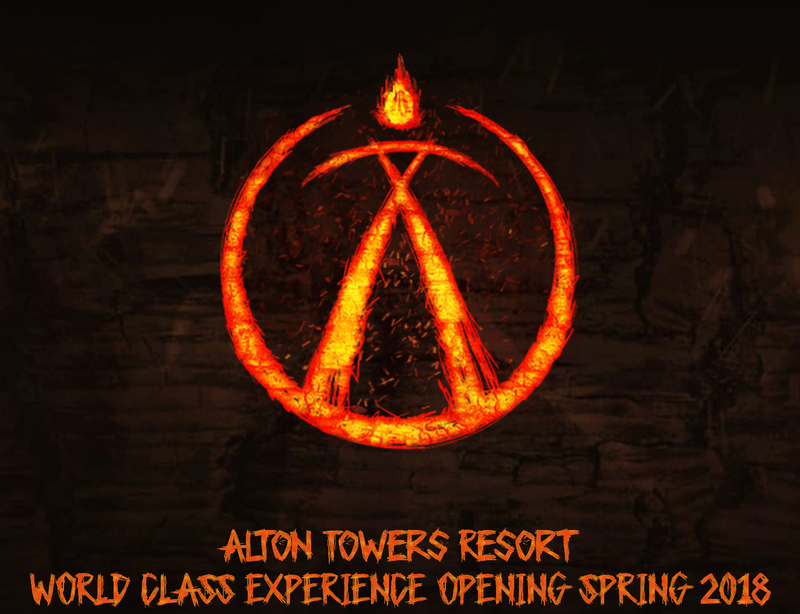 Alton Towers is continuing to keep their new for 2018 wood coaster a secret, but isn't shy about showing off what they've built so far. The Great Coasters International ride features a unique and twisted layout that sits on the side of a hill. 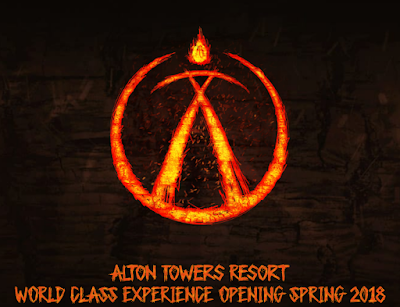 The video, seen below, that Alton Towers released gives great perspectives from the sky of the progress so far. 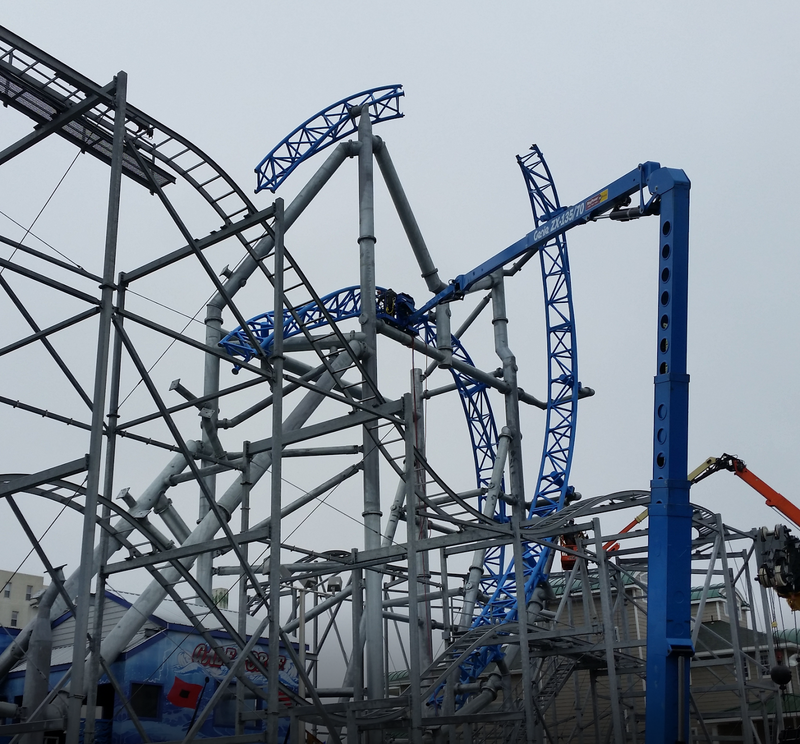 For more recent photos of the new ride, check out this update from TowersTimes. Previously I thought that the ride might not use a traditional chain lift, but from these new photos it sure does look like it will. Also of note is the progress made on the giant theming structure that the trains will pass through. No word yet on just what it is... but it looks like it has horns! These photos are bit late, having been taken on the last weekend that the park was open, but better late than never. Dorney Park is adding a brand new restaurant within Wildwater Kingdom for the 2018 season, named Tidal Wave Cafe. Seen above, the restaurant is modeled after similar very successful instillations at other Cedar Fair parks over the past few seasons. Tidal Wave Cafe will carry a nautical theme when complete, and feature "hand-battered fried shrimp, rotisserie chicken, hand-breaded chicken tenderloins, and house-smoked pulled pork" among other tasty meals. Getting a jump ahead of the cold winter, the park started major demolition to prepare for the new restaurant before the park even closed. 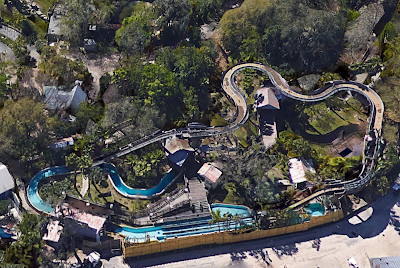 If you look closely at this photo, taken from Talon's exit area, you can see that much of the landscaping from the corner of Runaway River has been cleared. The park is carving out more space in this area to fit in additional seating to serve Tidal Wave Cafe. Back on the ground while walking through Talon's exit, you could see through this access gate that the space for the new restaurant is also being cleared. The new restaurant required the removal of two existing food stands, Mariner's Munchies and a Rita's Italian Ice, along with a small portion of the seating area next to Rita's that was added a few seasons ago. This photo shows that Rita's was already gone, and just some of Mariner's Munchies was standing. A trip on the park's train, the Cedar Creek Cannonball, also gave some views into the work that was going on. Here's another view of the bit of Mariner's Munchies that was standing, with a pile of it on the ground as well. The red building on the far left is Papa Luigi's, which was heavily renovated for the 2017 season. Here's one last photo of the work that was underway as the park closed for the year. Just this past week Dorney Park tweeted out a photo of the progress so far. All buildings have been removed, and if you look close you can see bulldozers removing part of the seating area that will be needed. When you consider all the space that has been opened up, it is easy to see how this multi-million dollar expansion will be pretty massive. You can also get a look at the changes to to the landscaping around the turn of Runaway River we mentioned earlier. 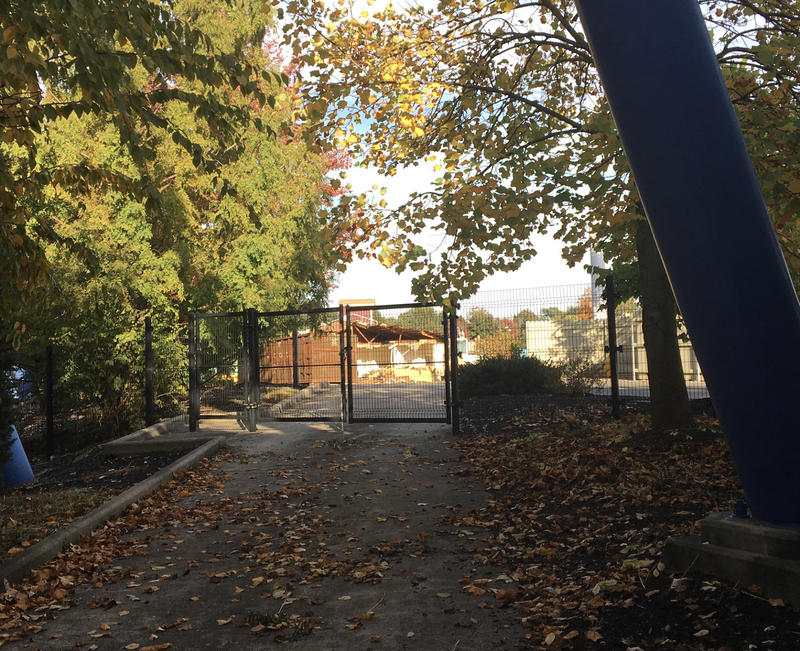 The park is going to be able to provide plenty of new seating for guests in this refreshed area of Wildwater Kingdom next year! 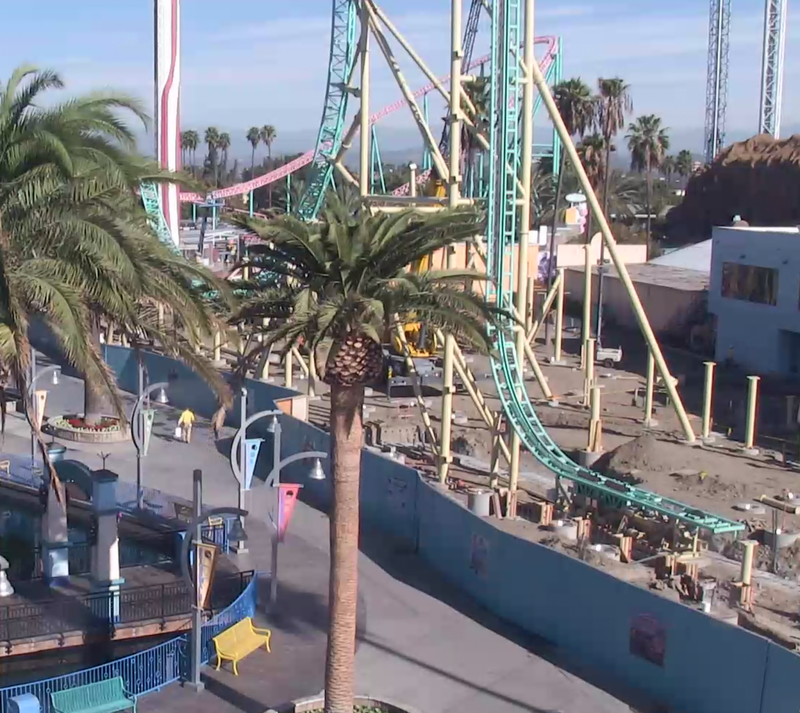 If you haven't been watching Knott's Berry Farm's live webcam of HangTime construction, then you missed the first track and support pieces of the custom designed Gerstlauer Infinity coaster being put into place this week. And they're moving fast! Just a couple days after the first support pieces were placed the structure suddenly grew taller than the webcam could show. The track that can be seen in this capture from the webcam takes place just after the ride's station, and will start to climb the 150 foot vertical lift from here. 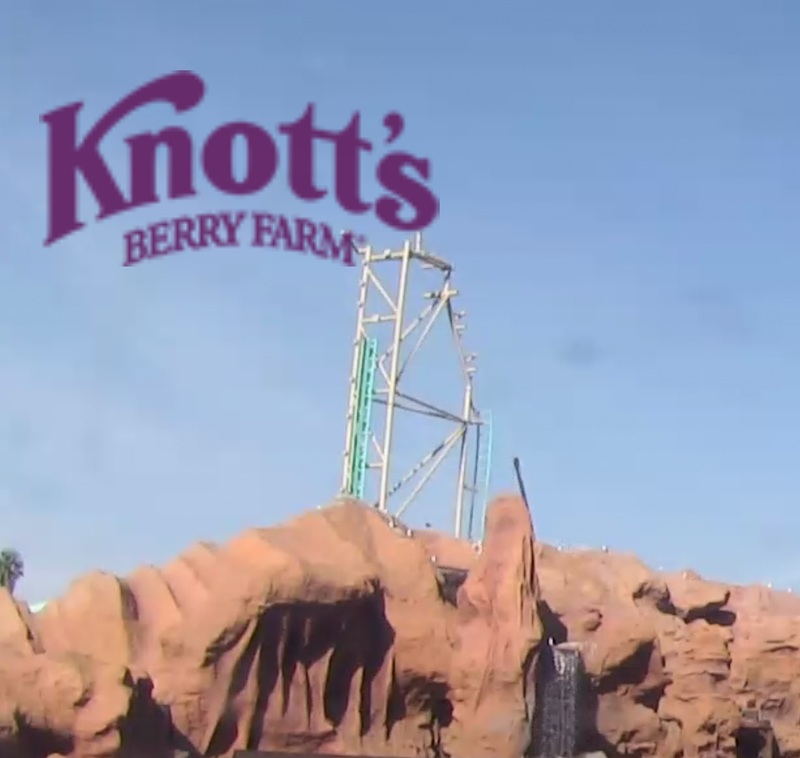 Other support pieces have been put in place as well, and the lift tower looks to be near maximum height in these photos from Knott's Network. Today Knott's Berry Farm released the anticipated animation preview of HangTime, showing off both on-ride and off-ride perspectives - the one above is what riders will see when they momentarily pause 150 feet in the air before plunging down at a beyond-vertical 96 degrees. 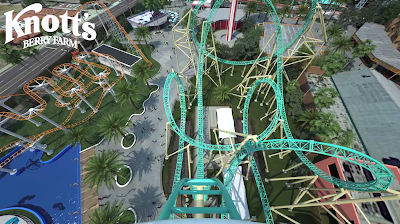 The rest of the twisted layout features 5 inversions including a negative-g stall loop, which is meant to give passengers a moment of pure hangtime while on HangTime! The animation also gives a hint of how the ride will look at night with special lighting that will trace the individual car's path through the course. Check it out below!